It just got a little easier to get customers directly to your front door. Uber and Yext have teamed up to create a “Ride with Uber” button businesses can use to drive traffic to their storefronts. What is the “Ride with Uber” button? Here’s how the “Ride with Uber” button works: Businesses add the button to their app, website or emails to send consumers to the business’s front door. Customers who use the button to get an Uber will also be able to see Uber fare estimates as well as pick-up ETAs. Some RevLocal clients are already using the "Ride with Uber" button to bridge the gap between online marketing and driving foot traffic to their stores. The button is designed to provide a seamless customer experience, and you will also be able to serve promotional content to the customer as they ride to your business. Why does the “Ride with Uber” button matter to RevLocal clients? RevLocal parnters with Yext to lock down your business’s listings and provide correct business information (such as NAP—name, address and phone number) to search engines, local directories, digital maps and social networks so that consumers can find your business when they search for local information. This means that the “Ride with Uber“ service is already available to RevLocal clients, and some of our clients are currently using the button to bring customers to their businesses. Clients who are already taking advantage of this service can use the buttons to bridge the gap between online and offline marketing, seeing the results of their online efforts turn into foot traffic. The button is making it easy for local businesses to bring customers into their store and provide value to customers, with services such as one-click ride booking and a targeted brand experience within the Uber app. And even if this seems like you'd be jumping on a trend or fad, Uber isn't going anywhere. The company has seen continual growth in recent months, its usage soaring 15 percent from June to August 2016. RevLocal clients and businesses that use Yext will be able to appeal to Uber’s huge customer base, and that’s a lot! Uber completed 62 million trips in July. The company also happens to be the most highly valued, privately owned startup in the entire world. If your business is located in a city where Uber cars are available (and hey, even if you aren’t) it’s extremely important for your local citation information to be correct. When local consumers are searching online for local information, you want them to find your listing with a link to your website. Your website could then include a “Ride with Uber” button, making it easier than ever for consumers to get to your business. While the customer is on their way to your business, you could send them information such as special products or services to give them ideas of what to purchase before they ever step inside your store. 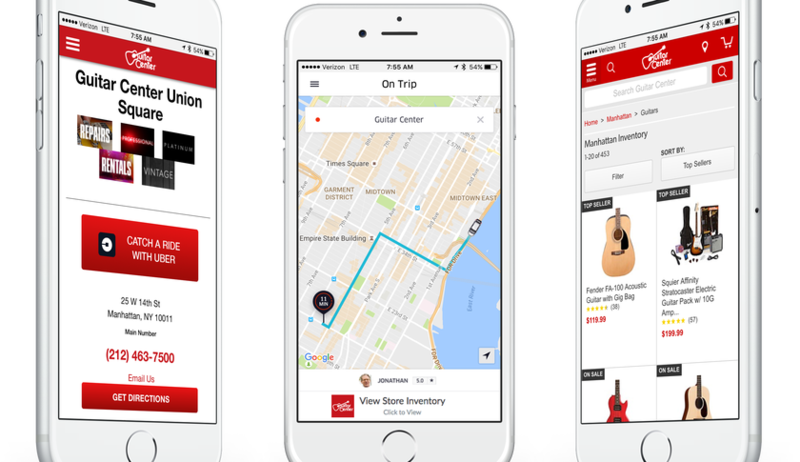 Guitar center has been using the "ride with Uber" button to drive customers to stores and serve branded materials during the ride. What does the "Ride with Uber" button mean for RevLocal clients? RevLocal and Yext customers are already using this button to drive business to their stores. Because those businesses are able to place a location pointer in a precise location, they can use Uber to bring customers directly to their front door. Even if your business isn't using the "Ride with Uber" button, you should still be thinking about using digital marketing to bring customers to your front door. And if you are using the "Ride with Uber" button to drive foot traffic to your brick-and-mortar business, remember that your online information needs to be correct and consistent across directories and social media so that search engines know to display your business in local search results. Before new customers can choose to use your business and click the Ride with Uber button, they need to be able to find you in search results. If search engines such as Google or Bing decide to do something similar, eventually, local search results could show something like the “Ride with Uber” button. Until then, correct your online information, build local citations and make it easy for customers to find you. I talked to some of our Digital Marketing Strategists who are currently testing the "Ride with Uber" button. Morgan Schaeffer, Retail Services Team Leader said that the "Ride with Uber" button is an exciting way to drive customer engagement and promote local offers. "We are always looking out for ways to improve our strategy and help clients take advantage of everything RevLocal’s partnerships have to offer. The Ride with Uber integration allows us to provide a unique feature to bring more foot traffic to local businesses. I am excited to be able to create an engaging experience with our client’s customers by promoting local offers/specials during their Uber ride!" Schaeffer said. How can local businesses use the “Ride with Uber” button and Trip Branding? Wondering how your business could use the "Ride with Uber" button and Trip Branding? We have a few ideas for you. When a customer clicks your “Ride with Uber” button, you can send them ideas for stocking stuffers or holiday favorites. Let them know if you offer gift wrapping services. Give them an idea of what’s in stock. This is a great opportunity, not only to literally drive customers to your business but also to serve them with hyper targeted content. You can send the user any content you think will be helpful, and they’ll see it only during the drive to your store, when it is most useful to them! Once you're using the "Ride with Uber" button, you can use Trip Branding to provide users with more information or show them products and services they might not have otherwise considered.You have the chance to showcase your best products and services, provide tips on what to buy, send a discount, show a tutorial or even allow customers to order something on their way to your business! With the growth of companies like Uber and lift, this could mean a whole new style of targeted content marketing for customers who are on their way to your business. While so much of local search marketing involves getting your business in front of consumers who have never heard of you, this could mean you spend more time targeting (and up-selling to) customers who you know are going to use your business. And you could collect email addresses from those customers using Uber to get to your business, targeting them later with email marketing. Send an email saying it’s been a while since they’ve been to your business and offer suggestions for their next visit. Include the “Ride with Uber” button. You can be hyper targeted and personalized with this type of marketing, since you know the customer has used your business before. Looking to use the "Ride with Uber" button for your business? Contact your Digital Marketing Strategist today to find out how you can take advantage of this new feature.